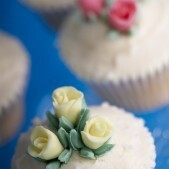 Ideal for weddings, birthdays, general celebrations or just as an afternoon treat. 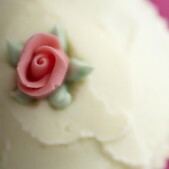 Our classic sugar rose cupcakes are individual handfuls of perfection. 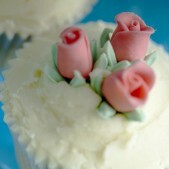 These perfectly dainty sugar rose cupcakes are the perfect modern alternative to a traditional wedding cake. 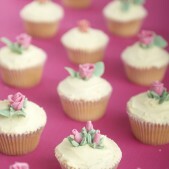 With a magnificent cupcakes tower, these pretty creations are smothered in delicious buttercream icing and topped off with tiny handmade sugar roses. 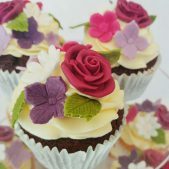 Your wedding cupcakes can be personalised according to your colour scheme and can be used as an alternative wedding cake or can also provide the perfect miniature additions to a main cake. 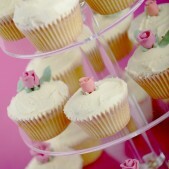 Our sugar rose wedding cupcakes, as featured in the Oct/Nov edition of the Wedding magazine, are so delicious and perfect for any occasion that there is no reason to wait until your big day to eat them! 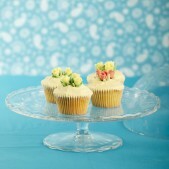 Why not place an order for your summer garden party, your best friend’s birthday or for any special occasion. 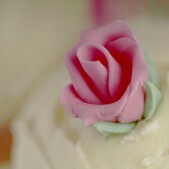 Sugar rose wedding cupcakes are £3.00 per cupcake with a minimum order of 12. 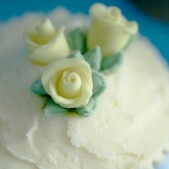 Cakes by Robin enjoy creating wonderful wedding cakes and we are happy to speak with you regarding the ideas and visions you have for your special day so that we can design the perfect wedding cupcakes or cake that will be the awe of all your guests.